Back in the fall I stopped in at a relatively new BBQ place in Leavenworth, Kan. called “All Slabbed Up” to see what it was all about. It turns out it was a great decision, as I found one of the best sandwiches known to mankind. 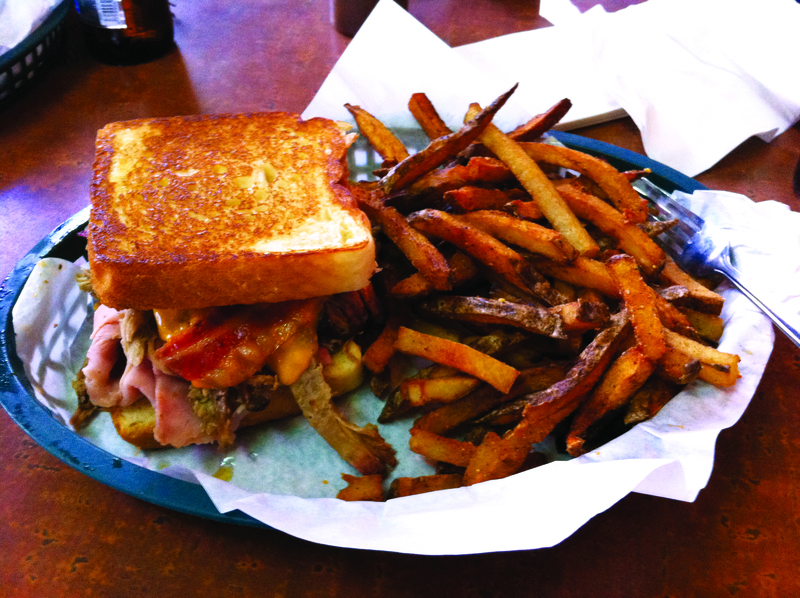 It was pulled pork, bacon, and ham together with cheddar cheese in a Texas toast sandwich! I added a little BBQ sauce to it and it was close to divine. You pair this sandwich with some of their fries (more like skillet-fried potatoes) and you have something that is last-meal worthy! In fact, I considered going up there the day before our latest supposed apocalypse just so I could have an excuse to eat it. I really have nothing more to say about this sandwich. I think the picture says enough! Overall, “All Slabbed Up” is a great place to eat. I like the atmosphere, and was really impressed with the quality of the food. The place is easy to get to, as it is on the west side of Highway 7/73 in Leavenworth at Muncie Rd. (across from the Ford Dealership). It’s a fun little place that is putting out great food, and is a viable spot to keep in mind if the world is about to end and you have the desire to eat a lot of pork in a short amount of time! ATTENTION BACON LOVERS: Only six hours until our contest giveaway to Bacon Fest KC is closed! Yes it’s true. We are giving away 5 VIP tickets to Bacon Fest KC! Head over to last week’s post, Studley – Cooking on the Cottonwood to learn how you can win. Entries must be submitted by today, July 9th at 5:00 pm CST.